There are concrete and plaster residues left on the surface after laying. 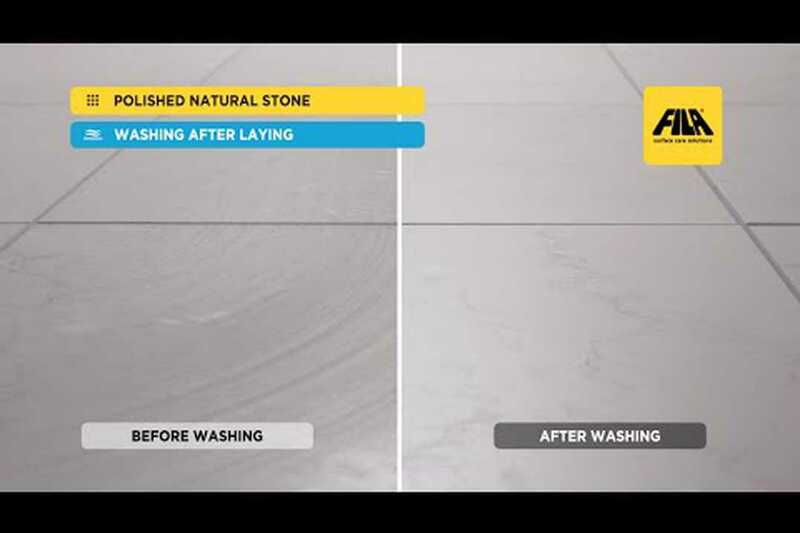 Acid washing is fundamental for removing laying residues and building site dirt from floors or other surfaces. We therefore recommend washing with the appropriate dilution of DETERDEK acid detergent and rinsing thoroughly after application. Please follow the instructions on the label carefully. There are epoxy plaster residues left on the surface after laying. Epoxy plaster is normally used to give totally non-absorbent grouting, resistant to acid dirt. Residues of this kind of plaster cannot be removed with normal acid products for washing after laying. We recommend using undiluted FILACR10 detergent for epoxy residues, leaving it on the surface for at least 30 minutes. Then rub with an abrasive sponge or spatula. Rinse the surface thoroughly to complete. Repeat the procedure if necessary. Porcelain stoneware is usually non-absorbent, unless it is given a “smooth polished” finish, which may lead to a certain degree of stain absorption. In this case we recommend treating with FILAMP90, the stain protector for polished surfaces, to be used on perfectly clean, dry surfaces. Porcelain stoneware with a textured finish tends not to absorb stains, but to accumulate surface dirt from through traffic. FILAJET is a dirt repellent treatment for interior floors, to be used on perfectly clean dry surfaces. The crackle effect is obtained with fine line cracks in the glaze. Dirt can however be absorbed through these cracks, staining the tile. We therefore recommend treating with FILAMP90 stain protector, to be used on perfectly clean dry surfaces. To waterproof and make grouting non-absorbent, apply FUGAPROOF stain protector, which prevents stains from being absorbed, making accumulated dirt easy to remove. FUGAPROOF can be used to protect absorbent grouting on any kind of floor or wall without it altering its appearance. In this case rinse well with clean water, using clean cloths that do not leave lint on the floor, rinsing often and wringing the cloth out well. If the floor is highly polished a wipe over with a woollen duster or machine polisher may be sufficient. To stop these residues making the floor dull, take great care to remove all traces of dust before washing, preferably using a vacuum cleaner or special woollen mops or dusters. Never use too much detergent in the water, unless the floor is very dirty and will be rinsed after cleaning. This kind of dirt is only superficial and is not absorbed deep down. Above all it needs abrasion to remove it. Pour FILACLEANER or FILAPS87(diluted following the instructions o the label) onto the surface and rub with a green abrasive sponge. Rinse thoroughly. Remove the stains with FILASR95. Pour the product directly onto the stain, leave it to work for about 15 minutes, then remove residues with a damp sponge and rinse with water. Repeat if necessary. This problem is usually caused by residues on the surface from laying or polishing. These residues form an even film on the surface, which is not visible as “dirt” but reacts to acid substances that cause streaks (e.g. drinks, lemon, etc). This problem can be solved simply by removing these residues, washing with special DETERDEK acid detergent, diluted 1:5 in water, and a cloth on a flat brush and rinsing off residues thoroughly. The grouting on my floor/wall covering is dirty. How can I clean it? Dirt tends to accumulate easily in grouting, turning it black and making it a critical factor for floor hygiene. Floor grouting must be cleaned with an alkaline product such as FILAPS87, that does not harm the plaster, using a brush to make removal of the dirt easier. Rinse thoroughly to complete. For walls we recommend using practical FUGANET spray detergent. Spray the product on the surface from a distance of about 15cm, rub with an abrasive sponge and then rinse. 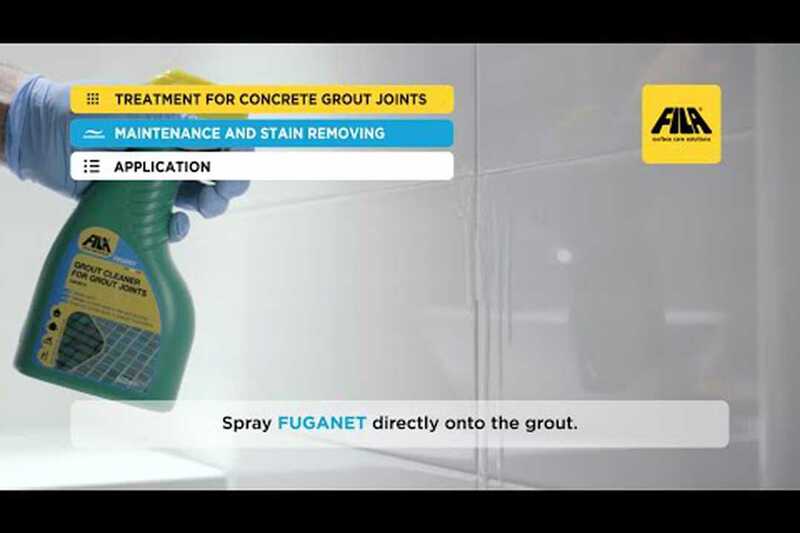 After cleaning we recommend protecting grouting with FUGAPROOF stain protector.